I cannot tell a lie. I fell in love with Robin from the moment we met–as did nearly every guy who either met her, or watched her in this movie, or in subsequent ones. And looking back, I think her performance as Princess Buttercup is vastly underrated. 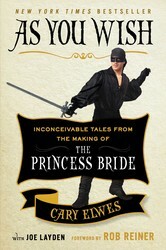 From As You Wish: Inconceivable Tales From the Making of The Princess Bride. She is so genuinely relaxed and comfortable in her own skin and also very focused at the same time. Getting to play her knight in shining armor on-screen also made me feel very protective of her off-screen—not that Robin couldn’t handle herself in any situation. In fact, I think it’s safe to say that everyone felt protective of Robin. I know there is a famous story (that has now actually been made into a cartoon!) where Robin was really beginning to feel the cold chill on the Derbyshire moors while shooting her kidnapped scenes with Mandy, André, and Wally. And she began to get the shivers. And once you get the shivers, it’s very hard to stop your teeth from chattering. So André, sweetheart of a man that he was, devised a technique to keep her warm that was very simple, really. He would use one of his hands as a hat on top of Robin’s head. She said it was like having a giant hot water bottle up there. It certainly did the trick; he didn’t even mess up her hair that much! In the years since we made the movie, the industry has acknowledged what those of us who knew her back then already realized: that she is an extraordinary actor. And she seems to only be getting better with time—something that can be said about very few actors. As I write this now, she is just a few weeks removed from her triumph at the Golden Globes, where she received the award for best performance by an actress in a leading role for her remarkable work as the devious and scheming Claire Underwood on the Netflix series House of Cards. In every role, she gives something of herself that’s unique. She never holds back and has that rare ability to tap into something deeply profound within herself that is appropriate for the character. 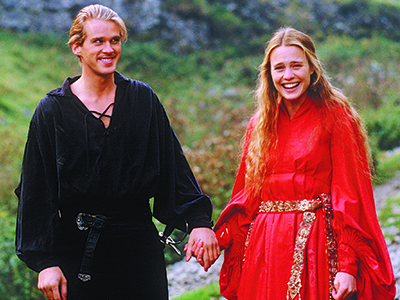 From actor Cary Elwes, who played the iconic role of Westley in The Princess Bride, comes a first-person account and behind-the-scenes look at the making of the cult classic film filled with never-before-told stories, exclusive photographs, and interviews with costars Robin Wright, Wallace Shawn, Billy Crystal, Christopher Guest, and Mandy Patinkin, as well as author and screenwriter William Goldman, producer Norman Lear, and director Rob Reiner.The Princess Bride has been a family favorite for close to three decades. Ranked by the American Film Institute as one of the top 100 Greatest Love Stories and by the Writers Guild of America as one of the top 100 screenplays of all time, The Princess Bride will continue to resonate with audiences for years to come.Cary Elwes was inspired to share his memories and give fans an unprecedented look into the creation of the film while participating in the twenty-fifth anniversary cast reunion. In As You Wish he has created an enchanting experience; in addition to never-before seen photos and interviews with his fellow cast mates, there are plenty of set secrets and backstage stories.With a foreword by Rob Reiner and a limited edition original poster by acclaimed artist Shepard Fairey, As You Wish is a must-have for all fans of this beloved film.